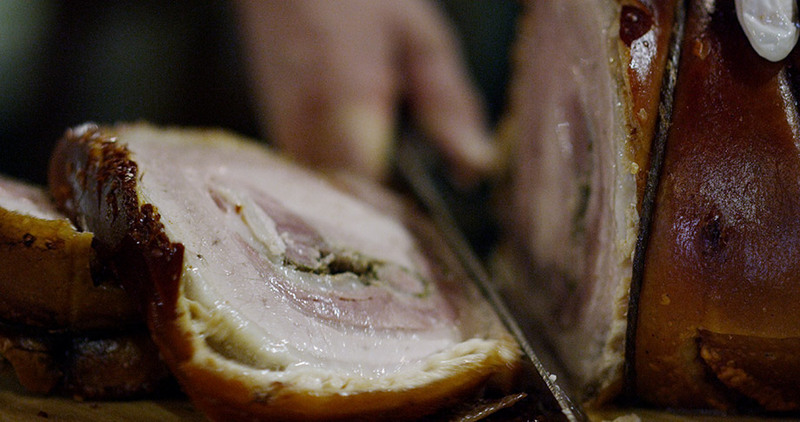 The origins of Porchetta di Ariccia PGI are linked to the Romanic and Latin populations. The first “Sagra della Porchetta di Ariccia” was organized in 1950. Since then, every year this evocative and typic event takes place in the city of Ariccia. Sellers offer the porchetta on decorated tables wearing traditional costumes. There is proof of this festival in the Registry of the Town Council, on September 14, 1962. In the archives of the Municipality of Ariccia, there is the contribution for the Patron Saint Apollonia festival and the porchetta festival. The pigs destined for this production are manually deboned removing the excess meat, used for other cold cuts and fresh meat. Later the meat is salted with sea salt, and let rest. Then the meat is massaged to eliminate the salt in excess on it. The meat is seasoned with garlic, rosemary and black pepper, and finally wrapped with natural cords before cooking. Moreover, it is fixed to a stainless steel tube to let the heat penetrate inside. This is an important passage because the meat stays compact in the following step. The product can be now cooked in oven at a temperature between 160° and 280° C for 3 to 6 hours. The heat reduction occurs gradually, in specific cooling rooms, at a temperature between 10° to 30°C (for 5 – 15 hours). That allows removing the excess fat and liquids and giving the right consistency to the crust, the typical color of the meat and better preservation status of the product. Porchetta di Ariccia PGI has a cylindrical shape, and a typical external brown crust. Inside it has a softer texture. It is tasty and spicy, thanks to the presence of rosemary, garlic, and black pepper. The slice is rose and white. It can be consumed as a starter or second dish in slices warm or cold. The Porchetta of Ariccia PGI is known for the crunchiness of its crust. Furthermore, it remains crunchy after cooking even after many days, preventing the product drying inside. 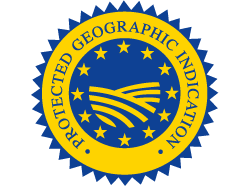 Protected Geographical Indication (PGI) recognized under Reg. UE 567 of 14.06.2011 – GUUE L 158 of 16.06.2011.